Home InspirationHolidays	5 Fun Ways to Use Wreaths! 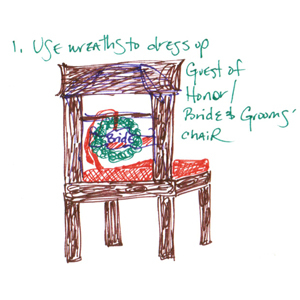 Wreath Use #1 – Use wreaths to dress up Guest of Honor or Bride and Groom Chairs. 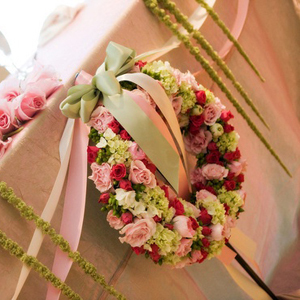 Look how great they look dressed up with a few flowers and ribbon! 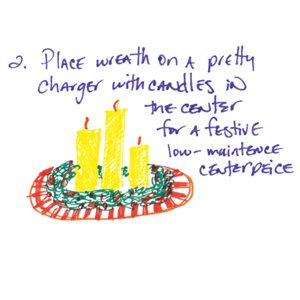 Wreath Use #2 – Place wreath on a pretty charger with candles in the center for a festive low maintenance centerpiece. I love this example found on Pinterest… Green, Simple and Chic! 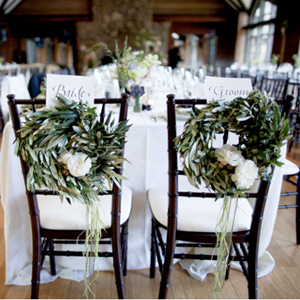 Wreath Use #3 – Use two or more sizes of wreaths, hung from pretty ribbons or hooks, to decorate a head table. I also think this would look great hanging from a porch or staircase. The beautiful floral wreath shown above is obviously a bit fancy, but looks gorgeous for this head wedding table, and I just love the hanging Amaranthus! Wreath Use #4 – Borrow (or find on Etsy!) 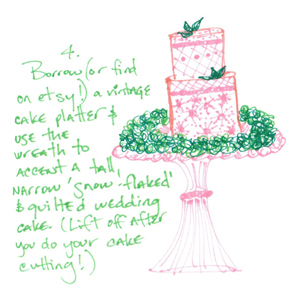 a vintage cake platter and use the wreath to accent a tall, narrow, snow-flaked and quilted wedding cake. Lift off after you do your cake cutting! Check out this gorgeous Chandler Vineyards Wedding where they used seeded eucalyptus to surround the bottom of their wedding cake. 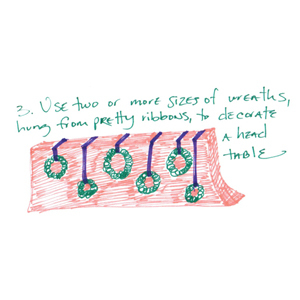 Wreath Use #5 – Use a large wreath (or two!) to ‘pin’ your guestbook or seating assignments in place. I love this idea! I first saw it done earlier this year…quick back-story…I meet Lauren from EveryLastDetail (love her blog!) at TSE (an event show…check out our booth and GiGi, our gorg. floral bride here!) and since we give all those flowers in our booth away at the end of the show, I told Lauren I would give her some to use for a Wedding Inspiration, included was a few of our rosemary wreaths. 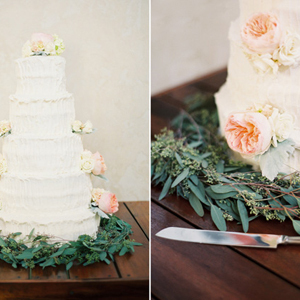 This is the Awesome Rustic Wedding Table Inspiration she and her team of friends came up with! 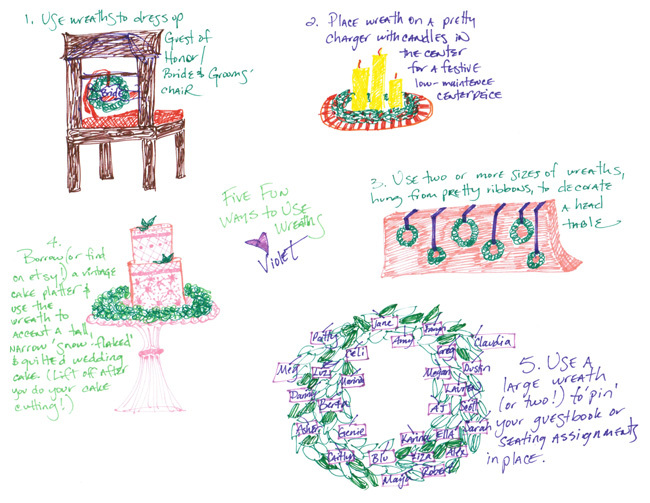 I hope you enjoyed these 5 Fun Ways to Use Wreaths! 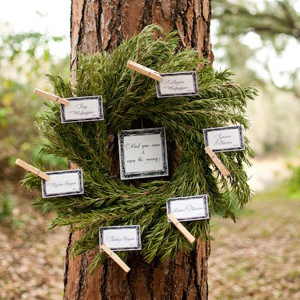 To see even more inspiration, check out our Wild about Wreaths board on Pinterest! 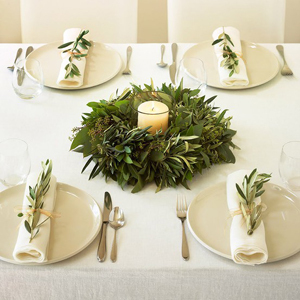 5 Great Uses for Garland – Re-Do!